The purpose of this page is to assist you with understanding your options, including basic operations and some limitations from Skype Meeting Broadcast and Skype for Business (remembering that Microsoft may change features or specifications at any time). This is not a sales page -- we don't sell Microsoft products, and we trust you will appreciate that all information about EventBuilder's suite of add-on functionality is tastefully shared sparsely and at the end of the page. Have a question you don't see here? Give us a shout. Why use Skype Meeting Broadcast? What is Skype Meeting Broadcast and its main features? What are the different roles used in Skype Meeting Broadcast? What is the difference between Skype Meeting Broadcast and Skype for Business? How do I pull a report for a Skype Meeting Broadcast session? How do I pull a report for a Skype for Business session? What elements of a "typical" webinar platform are missing in Skype Meeting Broadcast? What are the system requirements for Skype Meeting Broadcast? Can I give Skype Meeting Broadcast attendees a phone number to dial into? How do reports work in Skype Meeting Broadcast and what information is captured? If Skype for Business offers features that Skype Meeting Broadcast does not, what are its limitations? What information can I provide to the attendees to troubleshoot issues with Skype Meeting Broadcast? 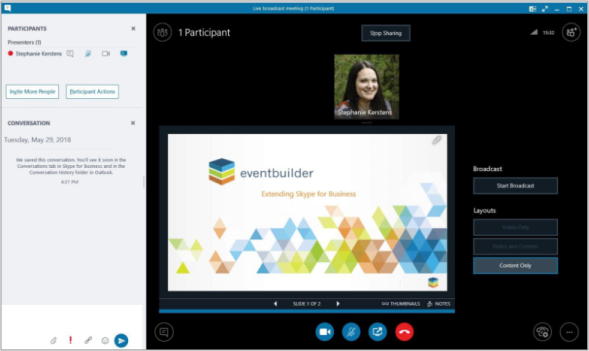 How EventBuilder complements Skype Meeting Broadcast and Skype for Business? How does EventBuilder complement Skype Meeting Broadcast? Why would I use EventBuilder's streaming mode instead of Skype Meeting Broadcast? Can I see a side-by-side comparison of EventBuilder features with Skype Meeting Broadcast and Skype for Business? Scale. Skype Meeting Broadcast works for webcasts up to 10,000 attendees. Free. Skype Meeting Broadcast is classified as a feature of two separate Microsoft products, Office 365 and Microsoft Skype for Business Online. Most licensing plans from Microsoft include Skype Meeting Broadcast at no addtional charge. Machine-driven transcription and translation. When enabled, auto-generated transcription and translation is available for auto-generating captions. Anonymous: No sign-in required, and anyone may join. The downside is that you will have no idea who joined your session. All company: Requires sign-in, anyone from your company (restricted to the same domain) may join. You will know who joined, but every person must have an account, or they will not be allowed to join. Invitation-only: Required sign-in, and only pre-designated participants may join. Yes, this means that you could have to upload a very large list and, at the present time, no bulk-upload is possible. Too, like the "all company option," every person must have a Skype for Business account enabled. Interactions (such as polling or group chat) in Skype Meeting Broadcast require use of a separate solution such as Yammer or Pulse. Skype Meeting Broadcast does not have traditional webinar-type reports and includes the following information. Reports may only be pulled by Event Team Members on the same domain. Reports do not include data points from separate solutions such as Yammer or Pulse. Correlating this information (such as if you wish to see all of one attendee's data and comments or votes in one place) requires manually combining separate data sources. Recordings are hosted for 180 days. Sharing recordings requires Office 365 Video if you wish to have the recording hosted at the same URL as the live event. Event Team Members (and only Event Team Members) may download recordings. Finally, Organizers may enable machine-driven transcription and translation for auto-generating captions. For troubleshooting alternatives, see that question on this page. Skype Meeting Broadcast identifies people in one of three ways: organizer, event team member, and attendee. This organization of roles assumes that in many large broadcast meetings or events that there will be several people involved in producing a broadcast. Manages the "broadcast producing controls"
"Event team member" is the role to use for Presenters. Using an embedded video in PowerPoint is not currently supported. Technically, Skype Meeting Broadcast is a feature of Skype for Business (and is included in most licenses of Office 365 and Skype for Business Online). Functionality, however, it operates as an entirely separate product. The table below illuminates key distingctions between Skype for Business and Skype Meeting Broadcast. (Note that there are more differences that what are outlined in this table). 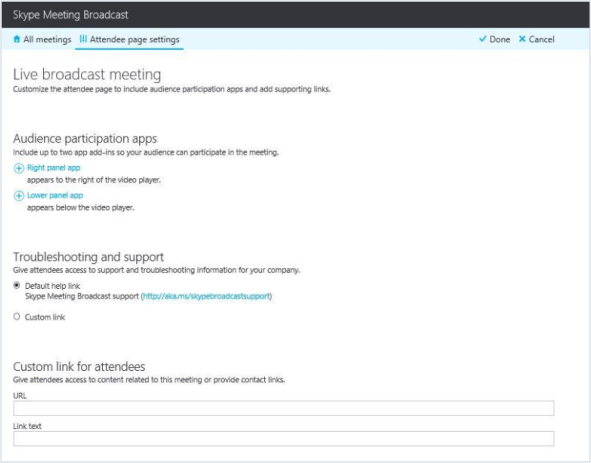 Microsoft suggests that Skype Meeting Broadcasts use a separate (external) tool like Microsoft Pulse. There results, therefore, are not part of your Skype for Business reports. Audio No Yes Skype Meeting Broadcast only offers streaming (VoIP). Reports Yes No Skype Meeting Broadcast reports are minimal: to Skype Meeting Broadcast offers no option for pre-registration. (non-webcam) No Yes Skype for Business only allows for videos to be played if thay are embedded in PowerPoint. Skype for Business recordings are created and stored locally. Sharing required you to have a place to upload. Skype Meeting Broadcast recordings may be automatically shared in the cloud if you have and use Office 365 Video. Scheduling via Outlook No Yes Skype Meeting Broadcast is accessed through a separate URL. All creation and management of Skype Meeting Broadcast events and recordings are separate from the way you use Skype for Business. Notes Skype Meeting Broadcast only offers streaming (VoIP). Notes Skype Meeting Broadcast reports are minimal: to Skype Meeting Broadcast offers no option for pre-registration. Notes Skype for Business only allows for videos to be played if thay are embedded in PowerPoint. Skype Meeting Broadcast is accessed through a separate URL. All creation and management of Skype Meeting Broadcast events and recordings are separate from the way you use Skype for Business. Notice in the image "Skype Meeting Broadcast presenter interface" that while the look and feel is similar to Skype for Business, the controls are different (and there are fewer features as illuminated above). As you see in this calendar view for Skype Meeting Broadcast, your broadcasts are managed in an entirely separate place. Results and reporting are neither accessible in a combined manner or in combination with other Skype for Business events or recordings you also use over the course of your webinar/webcast program(s). Skype Meeting Broadcast offers limited reporting, but it is integrated (unlike Skype for Business). What follows are both the steps required and three important things to remember. Select the session for which you would like a report. This will bring you to the “Meeting Details page” for that meeting. Click the “Download meeting report” or “Download Q&A report.” The report will download for you in the .csv format. Only Event Team Members may pull reports, and they must be on the same domain. If you wish to understand some typical statistics like the quantity of people that attended your session, be prepared – you will be manipulating raw data. For instance, because Skype Meeting Broadcasts captures “join,” “play,” and “pause” data per attendee, a single user ID will show up multiple in multiple lines of the .csv file. And because this is true for more than one data point, this means if you have a large event you could literally have a .csv file with tens of thousands of lines of data. If you wish to correlate data per attendee (such as how one person responded to multiple polls, be prepared to manually correlate disparate data sources. Skype Meeting Broadcast may be used with Yammer or Pulse for chat or polling, but these functions are not an integrated part of using Skype for Business. That data would be separate. 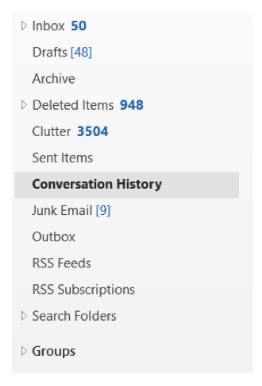 Unlike Skype for Business, the “Conversation History” captured in Outlook is only the names/emails of the Event Team members. So while it technically exists, it won’t give you any insight into your audience. Depending on your settings, you may or may not have a field in common in your multiple reports against which you combine and correlate information to accomplish your goal. If not, there is no way to get what you’re looking for. Click "Conversation History" tab on the left. A full conversation history isn't always captured automatically. To ensure that it is saved, you can press CTRL- in the conversation window in Skype for Business before you close the session. Registration. Skype Meeting Broadcast include options to require an invitee to sign-in, but there is no option to create a registration page for pre-registration and information capture. Comprehensive reporting. Skype Meeting Broadcast reports are minimal: Session IDs, attendee name and email, browser information, date and time stamps, language, and activity (join, play, pause). Skype Meeting Broadcast offers no option for pre-registration or integrated polling, so information is limited and limited to the standard "conversation history" in Outlook. Further, to understand simple metrics such how many people attended required significant data manipulation. Presenters can't "see" the audience. In a typical webinar you aren't going to have 50 or 500 turn on their webcams, but typical webinar platforms let presenters see attendee lists, use polls, and other means that act as a proxy or dashboard for "seeing" attendees. In Skype Meeting Broadcast you have no way to determine if someone is watching. Desktop or application sharing. Skype for Business has this obviously, but it does not scale beyond 250 participants. Skype Meeting Broadcast presenters may not share a live demo. Video playback or whiteboards. Note that video may not be used even if embedded in PowerPoint. Audience engagement and interaction tools (chat, polls, etc.). Microsoft recommends using a separate application. Yammer for group discussion and/or Pulse for attendee feedback/polling. Comprehensive reports that show responses by participant, therefore, are unavailable. Audio dial-in. Skype Meeting Broadcast is limited to one-way streaming. Synchronization. Latency is part of the Skype Meeting Broadcast experience. In our experience, this is usually about 30 seconds. System requirements for Skype Meeting Broadcast differ for Attendees and Event Team Members. Note, however, that you cannot schedule Skype Meeting Broadcasts unless your Office 365 administrator has enabled it. Learn more via this document from Microsoft. Attendees Edge, Internet Explorer 11, Chrome 35 or later, Firefox, OSX Safari, iOS 8 or laterm Android (KitKat). Note: Adobe Flash is required for Internet Explorer 11 or Windows 7, Firefox versions 41 and earlier, as well as Safari on Mac. For Skype for Business 215 apps, you must have the September Update, build 15.0.4747 or later. For Skype for Business 2016 apps, you must be using Click-to-Run, build 16.0.4227 or later (MSI installations only support the presenter role.) Event team members can join through a different client if no broadcast controls are needed, as explained in this knowledge base article. Or, if you're using a Mac, only the Skype for Business application is supported – not Skype Meeting Broadcast. See this knowledge base article for more information. If your version is older than the above, uninstall the app and then download and install it again. To host the meeting, producers need following licenses: Skype for Business Online Standalone Plan 2 (or 3). Enterprise E1, E3, or E5 — which contains the Skype for Business Online Standalone Plan 2 license. Event team members will be blocked if they are assigned one of the user licenses in this article. Attendees may join a Skype Meeting Broadcast using a Mac. Event Team Members may join using a Mac, but they will not see the meeting control options. In other words, you cannot operate Skype Meeting Broadcast solely from a Mac. NOTE: Visit our "What about Skype Meeting Broadcast and Macs?" page for a comprehensive, specific list of FAQs. Skype Meeting Broadcast does not have traditional webinar-type reports. What information is available is captured in multiple places – a downloadable .csv and in Yammer or Pulse if you have used those for chat or polls. Note, too, that reports may only be pulled by Event Team Members on the same domain. It’s worth repeating: if you want all possible data, you’ll need to grab it from different places and manually combine it. Remember, Skype Meeting Broadcast has no traditional pre-registration function, and consequently common webinar-type reporting to understand who registered, attended, registered-but-did-not-attend, etc. is not available. Skype for Business is designed for smaller, more collaborative meetings. Like Skype Meeting Broadcast, it offers no webinar-type registration pages, etc. Further, consider the following when using Skype for Business for a webinar or webcast. What information can I provide to attendees to troubleshoot issues with Skype Meeting Broadcast? We provide a link to microsoft.eventbuilder.com/smb. You are welcome to link to this. You could craft additional language (e.g., "make sure you’re not using a VPN or remote desktop" or "if experiencing trouble, refresh your browser or try a different one"). Use Microsoft's list of requirements as a guide. Add a registration page. Want invitees to pre-register (like a ‘normal’ webinar or webcast)? Deeper reporting. Skype Meeting Broadcast reports are sparse, not integrated with any other reporting (you can’t pull a report over multiple events, for instance), and inconvenient. Further, you may benefit from asking registration questions beyond just knowing name and email or other derived knowledge like who registered but did not attend. Cloud-based recording and sharing. Yes, Skype Meeting Broadcast can make and share recordings in the cloud (unlike Skype for Business), but it only works with an Office 365 Video account. When EventBuilder makes that recording for you, it’s available at the same URL, continuing to use the same registration page (if you wish), is managed along side all your other live and on-demand events in one portal, and included in any report you want to pull. Why would I use EventBuilder’s streaming mode instead of Skype Meeting Broadcast? Ease of invitee access. EventBuilder’s “streaming mode” uses an Attendee console has no downloads and works with any browser or operating system (presenters and moderators still use Skype for Business to present and engage). Screen sharing. If you want to show your desktop, you’ll have to use something besides Skype Meeting Broadcast. EventBuilder keeps presenters in Skype for Business and streams that to an attendee console, so you have all Skype for Business’ presentation features, including screensharing. Integrated interaction tools. Polling, questions, chat, use of handouts – normal audience interaction options – are not available in Skype Meeting Broadcast or require using separate products like Yammer or Pulse. “Seeing” your audience. Presenters fly blind in Skype Meeting Broadcast – it really is a broadcast. EventBuilder+Skype for Business gives you scale and those interaction tools that help you “see” your audience, their input and even, if you wish, the ability to call on someone by name. Share music or announcements before ‘walking on stage.’ Whether it’s sending a chat message to the audience or playing an MP3, early-arrivers to your session can be engaged. Keeping presenters in a familiar Skype for Business environment. Skype Meeting Broadcast requires a different login from Skype for Business – it’s like a separate product. Yes, it does look like Skype for Business, but it doesn’t have the same features. Keeping presenters in Skype for Business not only means they’ll know where the tools are instinctively (important when you’re live in front of an audience! ), they will be able to use presentation features like a whiteboard that Skype Meeting Broadcast does not have. Integrated, comprehensive reporting. As mentioned above, Skype Meeting Broadcast reports are limited and would require manually collating data from other products like Yammer or Pulse to have useful data about audience interactions. Further, pre-registration and post-event surveys add to the breadth of communications intelligence you’re able to gather with EventBuilder. 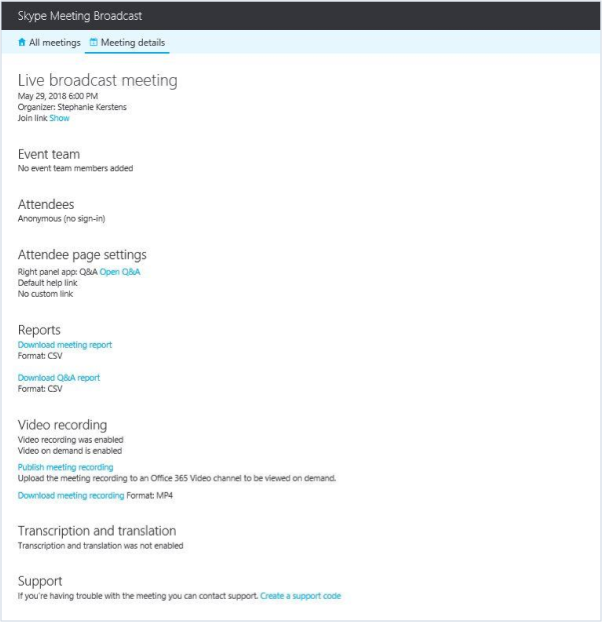 Oh, and simple, aggregate reporting on multiple events in one report with Skype Meeting Broadcast? Nope. In short, EventBuilder isn’t designed to replace your relationship with Microsoft communication tools, it’s designed to enhance that relationship (if not eliminate your need to pay for a totally standalone webinar solution). Can I see a side-by-side comparison of EventBuilder features with Skype Meeting Broadcast and Skype for Business?